I have just purchased a TC26DA New Holland. I had the r4 tires installed as thought it was needed for the loader use. I do a lot of mowing and experienced major problems with these tires skiding the grass and literaly tearing up the grass. 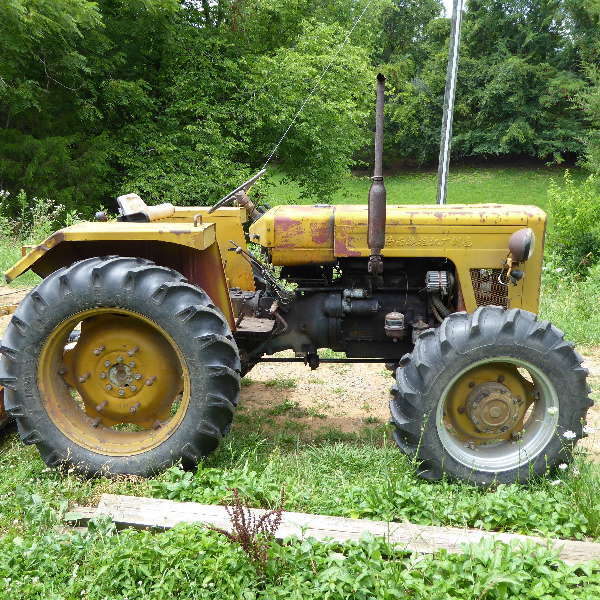 I purchased this tractor for multable use reasons. The mower appears to work beautifully, but the front tractor wheels just seem to plow the sod up and of course some tracts from rear tires. I had traded in my JD 455 diesel with turf tires and no problems in any weather conditions. Please give me your comments and or experience and suggestions with this problem. Are you mowing in four wheel drive? Does it stop at slower speeds? I am running turf on the front and R4 on the rear. The turf for the 955 fit the same rims. I don't have any problems but my soil is a heavy clay. Does your tractor have the NH Sensa-Trac 4WD? If so, maybe its engaging prematurely. happy: From what I can see on the NH web site, you don't have Sensitrac; I assume you have either 4x4 or 2wd mode choices? Sounds like it it's in 4x. The way to tell is jack up the front end and see if one or both wheels turn hard or with some resistance. If it is in 4x and the lever says 2wd, maybe it is a linkage adjustment issue. No,I am using two wheel drive. Our soil is a heavy clay also,but I never had this problem with the John Deere although it only weighed about 1,100 lbs.including the mower deck verses about 2,000 lbs. with the New Holland. You can tear up the turf even with turf style tires if you turn too sharp and too fast. The extra weight of your new tractor is also an issue, you need to be more careful than you were with the smaller rig. Making sure your ground is dry will also help minimize tracking, and you might look at the tire infation to try different settings. But while R4's can work on grass "turf" tires are somewhat better and you may ultimately want to switch. In responce to your using turf tires on the front I assume with the R4 on the rear you do not get as much or any scuffing of the grass and soil? I also have a feeling that the weight has much to do also in my case with the TC26DA. It is about 2,000 lbs. including the mower verses about 1,000 with the JD 455 including the deck. happy: It sounds like that indirectly it's the weight but only to the extent you can't take corners like you may have been able to with a much lighter machine--I call it "go-carting". Like Dennis suggested, just slow down a bit. I can get my 3000lb. TC33D going sideways around a corner on wet grass if I tried and it does have Sensitrac---there is so much momentum ad inertia in a heavier vehicle of any type that it just isn't reasonable to expect the front tires to pick up the slack and grip. It's sort of like driving on ice--if you take it slow you can turn. Do you have a differential lock that is either activated by foot or lever? If you do and you are using it---don't. All that will do is make the CUT go straight until the front wheels do grip. I'd be curious as to the toe-in being set right.